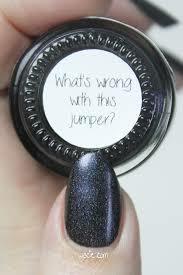 Swatch Sunday: Monster Polish’s What’s Wrong With This Jumper? Happy Sunday! I’m excited to show you today’s polish, because it’s from a new-to-me brand calledMonster Polish. This is one of the first two polishes I ever got from them, and I’m pretty floored by it. This is What’s Wrong With This Jumper? ; I’m wearing three coats with and without top coat. What’s Wrong With This Jumper? is a black holo with blue and purple shimmers. Application was very smooth; the product consistency was thin, but not drippy or watery. It was sheer on the first coat, but even out by the second; I had full opacity in two coats. The polish dries with a satin finish reminiscent of leather. When top coat is used, the holo effect and shimmers really come out, making it look like a completely different polish. I really struggled on whether to wear this polish with top coat or not. Usually, I put top coat on without question; I’m not a huge fan of satin and matte finishes, so I put on top coat because that’s how I would normally wear it. I’m actually shocked that I like this polish with its original finish. You can see the holo effect and shimmers and the dimension they create quite nicely with the satin finish. I was really impressed with it. However that didn’t stop me from putting on the top coat. I had to see what it looked like, and holy cow, I couldn’t believe it. The shimmers and holo effect are so much more brilliant, the dimension even more intense, I couldn’t believe it was the same polish. Honestly, I do prefer it with the top coat, because after I put it on, it was like I breathed life into my manicure. I don’t want to say that the original finish looks dull or lifeless, because that’s absolutely not true. I’m saying that the top coat is like icing on the cake. It makes the polish way more appealing to me. What’s Wrong With This Jumper and other pretties are currently in stock in the Monster Polish online store. This entry was posted in Swatch Sunday and tagged black, holo, indie, matte, Monster Polish, swatch.